George Geiger, 86, was the sole surviving member of the East Concord Cemetery Board when the Town of Concord took over the cemetery. “No one is willing to take care of” rural cemeteries, he said. George Geiger was the sole surviving member of the East Concord Cemetery Board. The other six members had died. No one else was interested in serving on the board, and no volunteers were stepping up to help take care of the graveyard at the crossroads of Genesee Street and Route 240. Geiger, 86, couldn’t do it by himself anymore. So earlier this month, the Town of Concord took over the cemetery. “No one is willing to take care of them,” Geiger said. As managers die and revenue declines, rural cemeteries face a dire future. With no volunteers stepping forward and resources depleted, some become financially insolvent. In many cases, town governments must take ownership of cemeteries on the verge of bankruptcy, meaning the towns have to add the graveyards’ expenses to their budgets. The trend has caused worry among town officials who are not eager to enter the cemetery business out of fear they may have to raise property taxes or slash spending for other needs. Cemetery board members wish someone would volunteer to help, but no town residents have expressed an interest. There are 268 not-for-profit cemeteries in Western New York’s eight counties, according to the state Division of Cemeteries. The Concord Town Board started managing the East Concord Cemetery last year and officially claimed ownership April 9. The town already owned the Spaulding Road Cemetery, which has not had a burial since 1956. Other cemeteries receive financial assistance from the town government. Concord pays a lawn service to mow Mortons Corners Cemetery and will soon provide Maplewood Cemetery up to $1,500. “We’d rather do that than actually own them,” said Town Supervisor Gary Eppolito. If the town did not aid Maplewood Cemetery at Main and Forest streets in the Village of Springville, Eppolito believes the business would go bankrupt. Town Board members have granted a $3,300 contract to Nature’s Pride, a lawn service in Springville, to mow the East Concord, Mortons Corners and Spaulding Road cemeteries. Eppolito fears the town will have to acquire more graveyards. 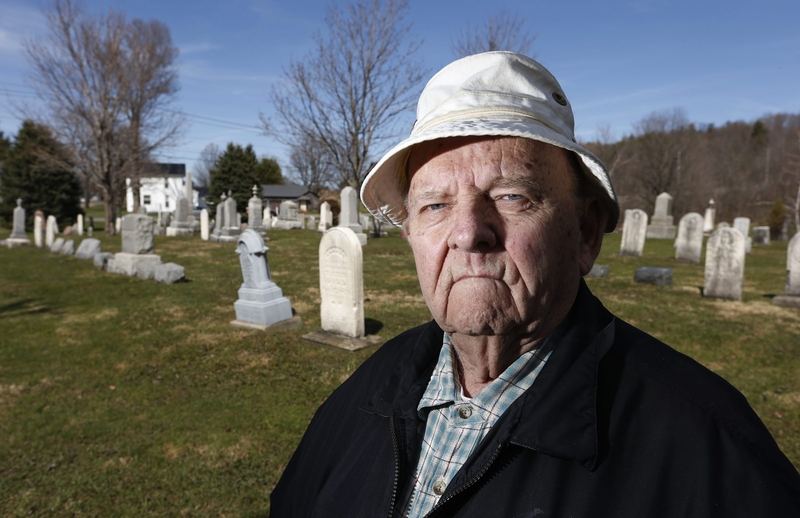 State law requires town governments to own cemeteries that can no longer sustain themselves. “All of the towns have the problem,” he said. At the Mortons Corners Cemetery, on Mortons Corners Road near Route 39, four cemetery association members oversee the business. David Carpenter, the cemetery association’s president, manages it with his niece, nephew and an unrelated woman. While the cemetery has some volunteers, it cannot afford to hire employees. He estimates 75 percent of cemeteries find themselves in financial trouble. Fiscal challenges arise from a lower revenue stream. Once most of the graves have been filled, fewer burials occur. Add the fact that more individuals now opt for cremation, which costs less, and cemeteries face difficulty paying for mowing, snowplowing, insurance and other expenses. “It’s not like it was years ago, when everybody had big funerals,” he said. Hiring someone to open graves, the largest expense, can be troublesome. “You have to pay extra for plowing to clear snow from the gravesites before burial,” he said. Fallen gravestones compound his problems. “I don’t know how to fix them,” he added. Another expense, state government fees, lower a cemetery’s revenue. The state requires every nonsectarian cemetery to contribute 10 percent and a $35 fee for each grave sold to a trust that cannot be withdrawn from without a court’s approval. Cemeteries must also give $5 to a state vandalism fund for each burial. They can apply for reimbursement from the fund to repair vandalism damage once every five years. Municipally owned graveyards, however, do not have to pay the fees. Besides the difficulty in paying the bills, finding volunteers to help trim weeds or clean gravestones poses a quandary. Geiger stressed the lack of reward for those who manage cemeteries in small-population towns. Before joining the East Concord Cemetery’s board, he served as the caretaker at the Fairview Cemetery on Middle Road in Springville for 20 years. In addition to the East Concord Cemetery, he knows of graveyards in the towns of Boston and Holland that went bankrupt. He cited the switch to cremation as a reason. “There’s a tremendous move away from full burials to cremation,” he said. Carpenter, 75, worries about what lies ahead for his graveyard, which has 250 to 300 plots, including an acre and a half available for more graves. He became involved because his grandparents, parents and other relatives are buried there. If no one else wants to help, he fears the town may someday have to own it. “What would happen if I’m not there?” he asked. He emphasized the need for more residents to get involved. “We really need help,” he said.